One of the staples of the Christmas television season is the movie “Holiday Inn,” starring Bing Crosby and Fred Astaire. ​Crosby, a refugee from the New York rat race, moves to bucolic Connecticut and opens an inn – the Holiday Inn - where he produces nifty numbers for the city's finest. We all know that movies are just pretend, but there really are places like the Holiday Inn. Whenever I dream of a White Christmas and the alpine sports, the family ski vacations in New Hampshire and Vermont I have enjoyed for more than four decades come quickly to mind. This sense of intimacy and tranquility extend to the trails and slopes of the region's smaller, family-oriented mountain destinations. New Hampshire’s Black Mountain in Jackson, Cranmore in nearby North Conway, Bretton Woods further north, in the shadow of Mount Washington, Waterville Valley, across the Kangamaugus on the southern side of Crawford Notch, and Stratton in nearby Vermont are built to human scale, and so are their parking lots. Many resorts trace their origins to immigrants from Austria who came to New England looking to recreate an American edelweis in the White and Green mountain ranges. For decades they have catered to generations of New Englanders: weekenders who travel from Massachusetts and locals lucky enough to ski almost-deserted slopes during the week. As a kid, these places were my home away from home. Today, they remain small enough so that children can ski anywhere -- alone or with friends -- without becoming lost or trapped by bad weather. The ski lift networks have forsaken the quirky conveyances of another era. Mt. Cranmore's famous skimobile has been replaced by a chairlift without a soul, as has Wildcat's two-person gondola, smaller than John Glenn's Mercury spaceship. Even the older chairlifts are more than adequate. The vertical dimensions of these places simply do not permit the seemingly endless rides uphill common out West. Mountain services retain much of their roots in an era when skiing was not thought of as a leisure sport. The restaurants are spartan, adequate as a place to buy or bring a lunch, yet not inviting enough to keep you off the mountain for too long. While you can't ski for days on end without skiing the same trail twice, you won't end up in another country if you take a wrong turn either. There is plenty of terrain for beginners and intermediates, who, no matter where they ski, are never far from the base lodge. Experts looking for a challenge will find none of the powder and steepness that the West offers at its best. The rewards are different in the East– skiing fast on hardpack down narrow trails, dodging the occasional spot of blue ice that escapes the groomers. The region's unpredictable terrain is the challenge forcing skiers of all levels to sharpen their technical skills. My three kids have been spoiled by numerous trips to Colorado and Utah. They like the packed powder and the sunshine, and who can blame them? But I am an inveterate champion of the advantages of skiing in New England, and they are also discovering that the region's charms can be infectious. ​Yes it can be cold, very cold. Bitter cold. We skied one Christmas at Waterville and near by Tenney Mountain, a terrific place for kids which I hope will reopen in 2002. Josh, then 4-years old, had to be watched constantly for frostbite. But he earned lots of `mountain man' points braving the chill. Like most well-dressed kids on the slopes, he was oblivious to the weather, just happy to ski the Quadzilla chair and ride the J Bar, cruising down the bunny slope in search of little jumps while keeping a safe distance from less experienced cousins. Bretton Woods faces Mt. Washington, New England's tallest peak and epicenter of some of the worst weather on the planet. One December, we skied in a misty rain, which created a fantastic fog that added to the downhill challenge. One day last year, the wind blew so hard, most lifts had to be closed at 3pm. As we set out that December morning, it was below zero, and some of the kids preferred sledding and tobogganing at the Mt. Washington Hotel nearby. But Josh and his friends weren't deterred. "We're still going skiing," he said. Music to my ears. We alternated runs down Swoop and Zealand with hot chocolate breaks and a lunch rather longer than the kids wanted at the Top O'Quad restaurant, where we could see the clouds swirling at the summit of Mt. Washington. That night, part of the roof blew off the Mt. Washington Hotel. 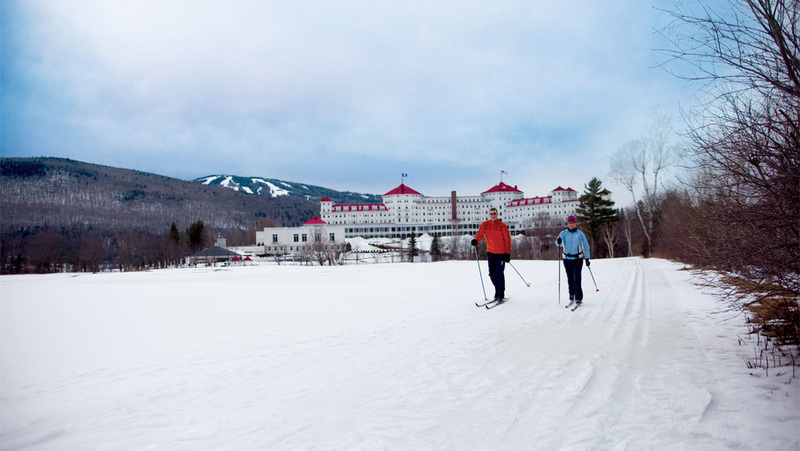 ​Bretton Woods is suitable for beginning and intermediate skiers of all ages. Most operators today strive to flatten all terrain to a predictable sameness, but that didn't seem to bother my kids or their friends and cousins, who took great pride in locating small jumps and other skill-building pursuits. The pace at Bretton Woods is also slow. At most of these smaller destinations, skiing is viewed as a skill to be developed over a lifetime, not one week. My younger daughter, Morgan, took her first lessons at Bretton Woods, at their wonderful one-stop-shop that combines equipment and ski school. She might have learned more elsewhere, but her first experience on skis was fun -- the most important achievement for any ski school. It instilled in her a love of the sport, and its expensive ski outfits, that she still retains many years later. ​At Cranmore, trails have been widened, and slopes groomed with the novice to intermediate skier in mind. Skiers can follow the sun by starting the day on the East Slope and moving over to the North and South slopes [which sit side by side!] as the day progresses. When I skied mid-week last year with Josh, we had the mountain to ourselves. From the top, we skied Rattlesnake to Lower Ski Meister, once, twice, countless times. A perennial favorite is the 2.3-mile Harvey Gibson trail, a highway-sized track that snakes around the outer perimeter of the mountain at a downhill pace guaranteed to build the confidence of any strong beginner or intermediate. Josh learned to ski at Stratton Mountain in Vermont, an easy two-hour drive from Manchester, New Hampshire. The skiing from the top was some of best I've experienced in the East in many years. Stratton is a cruising mountain. There is lots of moderate, steep but easy- flowing terrain off the top -- under the North American lift, or on the Spruce and Tamarack trails, which could be considered a smaller version of Steamboat's famous Heavenly Days slope. I had the upper slopes, with their wonderful views of Bromley nearby and Mt. Snow in the distance, almost to myself. Stratton was high on the list of friends who sung its praises as a family-oriented destination. During our pre-Christmas stay, there were just five kids in the entire ski school -- a number that balloons to more than two hundred during the holidays. Josh had virtually one on one attention from a new but committed instructor for two of his three days on skis. Morgan skied the American Express lift and the Betwixt trail under it, with her instructor and one other girl her age. Stratton’s long, varied, good intermediate terrain was guaranteed to increase her confidence, and it did. She didn't mind that there were no intermediate trials open from the top. For all of these welcome advantages, there are tradeoffs. Even if there is enough snow, many trails and lifts may not be open until the weekend. An absence of natural snow meant that none of Stratton's evening mountain sledding and snowboarding diversions were open. We were staying in a two-bedroom condo in the Village Watch complex that advertised itself as "ski in ski out." True enough, but the chairlift outside our condo was not operating. There was no snow and not yet enough traffic to justifying making it. Check each resort’s website for snow conditions and non-peak rates before deciding. G. A. ​My current New England favorite is Black Mountain, just outside the New Hampshire village of Jackson. Jackson is a great little place, home to a world class ski touring facility, one ski shop, a diner and real estate office, and the venerable Wildcat Tavern, where kids are welcome to sip hot cider and listen to the local, apres ski talent. A covered bridge, straight out of central casting, welcomes visitors off of Route 16. For decades the Wentworth Inn in the center of town, stood derelict, its yellow buildings in various states of decay. Luck saved it from the fate of other grand hotel buildings in the town that met their end by fire or a wrecker's ball. Today, the inn has been restored, down to the ice sculptures that grace the wrap-around porch. A piano sits opposite the fireplace. Newspapers from Boston and New York sit untouched nearby. ​Skiing early in the season, mid-week, or between the popular winter vacation periods has its advantages. Everything is cheaper, from accommodations to lift tickets. At Black Mountain, there were less than 30 cars in the parking lot on the sun-filled days that we skied, and that included mountain staff! We never waited in a lift line. For details on how to get to these ski resorts, check out the East Coast page or click on the name of each resort towards the top of this page.